There are 3 ingredients in family worship. One of the ways our family loves to keep track of our daily prayer time, and the people that we’re praying for is through the Bear + Squirrel Prayer Calendar. It’s a beautiful resource—my kids spend so much time ooooing and ahhhing over the illustrations and they love filling in the information about the friend or family member they choose to pray for. This calendar also does a great job in helping us pray both Biblically and expectantly for people. Not just that ‘so and so’ would be “blessed” or “well,” but specifically that they would increase in wisdom, that they would treat each others with kindness, that they would be mindful of God’s word all day, etc. You guys. We would LOVE to give one of our Happy Hymnody families a Bear+Squirrel Prayer Calendar. Head on over to our Instagram feed to get in on this giveaway! It ends at 11:59 pm January 7th! Don’t miss out! 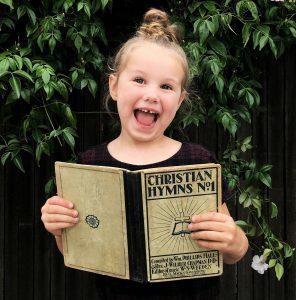 If you can’t wait and want your prayer calendar now, get $5 off with the code: HAPPYHYMNODY5 at checkout! Let’s devote ourselves to growing in this area of family worship this year!